Take your music listening experience to whole new level with the Musicians' Choice Over-ear Headphones from Able Planet! These stylishPurple headphones combine a truly remarkable design and first-rate sound quality. Doesn't fall out like eabuds. Doesn't move like behind the ear headphones. Earpiece shape is the most comfortable for extended wear. SONXTRONIC Xdr 8000 Vertical in Ear Ultralight Sport Running Headband Headphones. ~Slim Cap Design for Ergo Fit~. Earbud Comfort. All products have been inspected, and are new, unopened, factory-sealed. Like this item?. We married unparalleled sound quality with luxury design. A fine pair of audiophile headphones deserves an unparalleled presentation. Available in black or white! Enjoy your favorite songs. Built-in Bluetooth allows you to instantly stream music from your Smart Phone. The Active Sports Headset is easy to use and allows you to jump from listening to music to answering calls quickly and easily. Polaroid HD Wireless Audio Bundle Slim Portable Speaker Hi-Def Headphones PBT865. Condition is New. Shipped with USPS Priority Mail. Thank you for looking! We appreciate your feedback! Supersonic IQ127BT Bluetooth Wireless Neckband Earphones Mic Blue. Built-in BT technology for easy wireless pairing with enabled devices such as iPad®, iPhone®, iPod®, smartphones, tablets, MP3 players & more. Electronics:Japan Usage Item. Expedite : EMS. Battery capacity appears on paired devices and are sweat proof. Bluetooth: V4.1. Speaker Output Sensitivity: 104 dB. Battery Capacity appears on paired device. Speaker Size Inner Impedance: 16 ohms. Break free from cords and wires with these Insignia wireless in-ear headphones. Echo cancellation and noise suppression technology ensure your music is heard loud and clear, and the sweatproof design make these ideal for use at the gym. Panasonic RP-BTS30E Wireless Bluetooth Headphones - White. Using Bluetooth technology, you can move without the hassle of getting tangled in wires. With their 3D flex sports clip, the headphones feature ear hooks which are fully mouldable to the shape of your ear for comfortable listening. Maxell’s Action Kids Headphones with Microphone is perfect for the younger generation of athletes. 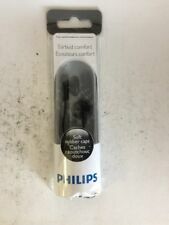 MAXELL 195004 Action Kids Earbuds. Built-in microphone for hands-free calls. Sized for kids heads. User Review. This is the perfect headset for anyone looking for premium sound and sleek style. Block out the annoying background noise and enjoy your daily commutes with the Artix Headphones! These dual colored headsets are bound to make sure you stand out in any crowd with a variety of stylish colors to choose from. SKU: WI3251. Master that super deep yoga bend without worrying your buds will let you down with FIGHT. Flex Grip forms to every ear shape, letting you bend your buds to the exact position you want and clamp them to your ear for the perfect custom fit. Hot dog earphones for hot music. The novelty earphones you never knew you wanted! Plug iPhone compatible, Gold plated. Powerful sound with 30mm neodymium driver units. Weight (without cord) 66g. Cord Length 1.2m. Input Capability 500mW (IEC). Sensitivity 103dB/1mW. Nominal Impedance 32ohms. Sony Active sports Ultra Secure Fit Stereo Headsets. Hybrid silicone rubber ear buds. Water resistant. Built for long-lasting comfort, the KE10 earbuds provide a pleasant fit for any size ear. With several colors to choose from, you're sure to find the perfect pair. Koss Ke10 Earbuds - Stereo - Black - Mini-phone - Wired - 32 Ohm - 40 Hz 20 Khz - Earbud - Binaural - Outer-ear - 4 Ft Cable (189775). Jvc Ha-eb75 Earphone - Stereo Over-the-ear - Binaural - Open - Mini-phone - Silver (haeb75s). Manufacturer Part Number HAEB75S. Product Title JVC HA-EB75 Earphone (HAEB75S). Earpiece Type Binaural. Sports ear clip earphone with adjustable clip structure which has 5 selectable positions for secure fit. Polaroid HD Wireless Audio Bundle PBT865GM Rose Gold. Speaker, Hi-Def Headphones, Earbuds. DC comics Batman headphones by iHip. They are wired. Jvc Ha-eb75 Earphone - Stereo Over-the-ear - Binaural - Open - Mini-phone - Blue (haeb75a). Manufacturer Part Number HAEB75A. Product Title JVC HA-EB75 Earphone (HAEB75A). Earpiece Type Binaural. Sports ear clip earphone with adjustable clip structure which has 5 selectable positions for secure fit. Good luck! Stream music wirelessly to your headphones AND use the built-in speakerphone to receive calls. High Performance Headphones and Earphones. Wireless Built-in Bluetooth Receiver. Sorry, no cash, COD, or personal checks. You should see the option when you check out. 3 different ear tip sizes. With a choice of colours to suit your style, 9mm neodymium drivers for powerful, balanced sound and supplied with 3 different sized earbuds, the ELR50 are a fine choice. The ideal match for those who live life on the move, combining an ultra-light aluminium design earphones with a neodymium driver for high precision sound. Headset type Monaural. Ear coupling Intraaural. USB, 22 g, 100 m. we do not take any responsibilty after this. Weight 22 g. Product colour Black. you can buy in set of 6 max. Wireless range 100 m.